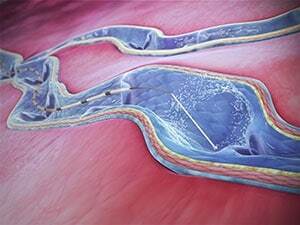 ClariVein® IC Infusion Catheter - Minimal Recovery. Maximum Results. 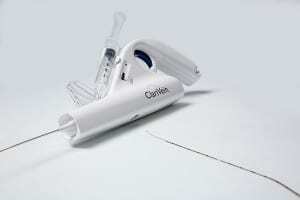 The ClariVein infusion system includes a powered, specialty catheter with a unique rotating dispersion tip. Includes infusion catheter, rotating wire, and dispersion ball together in a cartridge for secure fastening to the Motor Drive Unit (MDU). Self-Contained & Disposable: Fully self-contained, single-use device with no need for capital equipment purchase. Single-Handed Operation: Motor Drive Unit designed to be fully operational with one hand. Variable Rotating Speed: Multiple speed settings allow for rotating wire and dispersion ball to rotate between approximately 2,000 and 3,500 RPM. Power System: The Motor Drive Unit is operated by a low voltage, self-contained power system. Small Profile: <3 French infusion catheter. 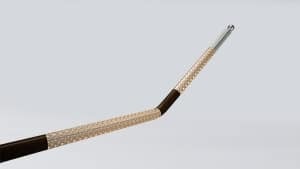 Flexibility: Flexible coaxial infusion catheter has a rotating wire and a dispersion ball at the distal tip. Good Imaging Visualization: Rotating wire and dispersion ball is easily identifiable under imaging guidance. Excellent Pushability: Powerful torque designed for vessel navigation. Visibility: Radiopaque markers for predicable pullback and infusion. Custom Fit: Multiple catheter lengths available. Select size based on patient anatomy and desired tip location.